New type Chinook 582 all yellow. Turn key. A-1 condition. Radios helmets included. $18,000. Suzuki 1.3 litre 4 cylinder auto engine with gearbox for aircraft use. Leburg crank triggered electronic ignition for four cylinder engines. Will work on any four cylinder engine. Comes with Ford Visteon coil, trigger wheel, electronics and manual. Dwell curve built into the electronics. Easy installation. $700.00 invested. Asking $300.00. Tim Vader, 403-620-3848, vadert@shaw.ca. In Alberta, ultralight airplanes crashed near Ponoka, Indus and Lloydminster in the summer of 2012. That’s three accidents in as many weeks – one fatal. Aviation enthusiasts say ultralight aircrafts are well-built machines. They point to Transport Canada, saying the required training hours are not always enough. How safe is the hobby? What causes accidents? Mechanical problems or pilot error? How can “rules” be balanced with the public’s freedom to fly? Alberta is a hub for this hobby, and we get the discussion on life and death issues off the ground with three experts. Mike Hughes, from Wetaskiwin, owner of Challengerwest – sales and support for advanced ultralight aircraft in western Canada; Shane Daly is President of Innovative Wings Inc., which offers building and maintenance service for amateur-built and home-built aircraft; and Norm Vienneau, President of the Calgary Recreational and Ultralight Flying Club. I was, as the saying goes, right on the ragged edge. It was the toughest approach I’d ever made in 25 years of flying, right at my limits, and it was fun! I fought turbulence and wind shear like I’ve never seen. And for a few seconds I was actually frightened in an airplane; a very strange feeling for me. And I did make it, but it was ugly. I touched down beneath the trees on my first bounce just as a three-point buck wandered onto the last third of the strip. But by the end of my second bounce, I knew this just wasn’t meant to be, nor did I want to subject my wingmen to such a beating. I powered up, still coursing with adrenaline, and left that backwoods airstrip behind. And then there’s Darren Scarlett, who owns an RV-7. It’s beautiful and powerful. It has a 180 horsepower engine and a constant speed prop. It’s fast, too. I mounted a video camera in his cockpit once and recorded him as he did three rolls and then pulled up into a Cuban Eight. I watched by the runway as he shot a low inspection pass at high speed. I could see his smile flash as he zoomed by in the sunlight. How about Geoff Pritchard? He’s got this pristine, and I do mean pristine, 1946 Champ that he recently rebuilt from the ground up. It’s gorgeous in red and white. When that Champ is on the taxiway silhouetted against the evening sun, or in the sky against the deep blue, the effect is simply mesmerizing. Geoff and the Champ float along up there thumbing their noses at age and time, making the most of every minute they’re in the sky. Wade Miller has what some consider a dream job. He’s an airline captain. He pilots a 737, worth around $70 million dollars, probably more. It has stuff in the cockpit that comes straight out of Star Wars. And Wade gets to work with it all. The plane’s capabilities are simply amazing. It zips along at about 500 mph, climbs beyond 40,000 feet, and still lands on runways only a mile long in nearly any weather. And 737’s make money. 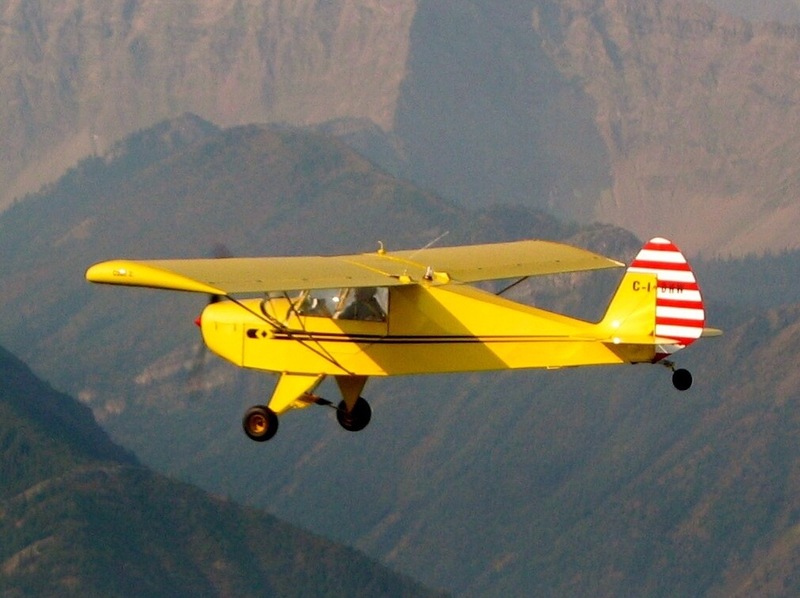 Barry Davis flies a homebuilt airplane now, but he used to fly a Cessna 182. A great deal of that flying was done at night. He’d cruise over the city and watch the world sleeping below. He’d see cars and trucks scooting along beneath the endless cones of street lamps. A million or more lights of all colours would dazzle as they reflected from the glass of the downtown skyscrapers. Red and green fireflies would race through the blackness above the horizon as other planes came and went at the airport. And an uncountable number of stars would twinkle overhead until an errant cloud would scrub them away for a few moments. And Bob Kirkby. Bob has a terrific airplane – a Piper Super Cruiser. It’s a flying piece of history that looks like it just rolled out the factory door. It did, of course, back in 1947, but you’d never know to look at it. Bob loves to get up in the Cruiser with one of his grandkids, or another airplane buddy, or maybe just by himself. He’ll go about half an hour away to where there’s a restaurant that serves pie almost right next to a grass airstrip. Bob and the Cruiser love grass runways. After pie, he’ll take-off to who-knows-where and cruise along at, oh, maybe a thousand feet over the ground. He’ll watch as the land changes color in the season, maybe getting greener, maybe browner. Bob will feel the stick as the wind tugs on the ailerons every now and then, checking to see what it can get away with. He might snag a thermal and then ease off some power as that small burst of heat floats him along a little bit faster on a little bit less gas. Bob will smile at that. And soon he’ll make that last turn onto final approach at his own grass airstrip. Bob will set the Cruiser down so smoothly that for the first few seconds he’ll wonder if he even landed. Really, I’ve seen him do it. Oh, ya. Now, that’s flying!